These Farm Heroes level 2 cheats and tips will help you beat level 2 of Farm Heroes. 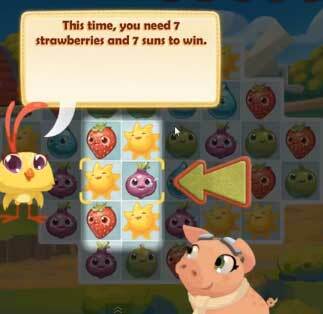 The objective of Farm Heroes level 2 is to collect 7 strawberries and 7 sun in 10 moves. Once again you are going have to follow along with the game’s in-guide tutorial. The game’s tips are going to help you immensely in not only the beginning, but also when you get to more difficult levels. Simply pay attention to what it tells you to do in Farm Heroes Saga level 2. This level guides you into two matches and then you take the reigns to play on your own for the first time. This is also the first level that you could actually lose, so even though it is not difficult to beat, you shouldn’t take it lightly because there is a possibility of running out of moves without collecting the required amount of cropsies. In addition, losing the second level of the game, which is also another tutorial level, would be degrading and embarassing, so don’t take it for granted and use it as a learning experience. As you advance through the early stages of Farm Hero, it’s important that you try and create matches larger than 3. By creating matches higher than 3, you will collect a larger amount of cropsies. 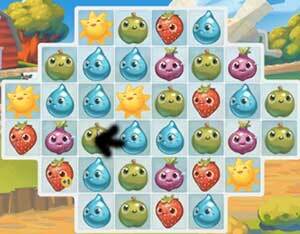 For this level you will need to need to collect 7 yellow suns and 7 red strawberries. Remember that you only have 10 moves, so try and create larger matches so you can complete your objective more efficiently. Try to create horizontal matches in the center since you have the most room there. If you can, it is more beneficial to create combinations of 4+ resources. When you make a match of any amount of cropsies, the surrounding required cropsies will get +1 boosters. These add on to your score of the amount you collect, so it makes it easier to get to your total. So even if you can’t make a match of your required cropsies, it is beneficial to make a match adjacent to them so you can get the +1 boosters to maximize your possible score. Making matches at the bottom of the board is also good because it brings new cropsies into play and gives the possibility of making cascading matches. Cascading matches are those that come when new cropsies fall into place that happen to make a match with their fellow types. Again, these tips are most likely irrelevant for Farm Heroes Saga level 2 because of the simplicity of the level, but they are good to know for the future when levels become increasingly difficult and you will need all the help you can get. In level 2 you must collect 7 suns and 7 strawberrries. Focus on collecting only these cropsies, since the other cropsies will not help you reach your goal. Keep an eye on how many suns and strawberries you have collected, and how many more you need to collect to beat the level.